Continuing with the reintroduction of our Knot of the Week series in high-definition, today I’ll be going over the Tape Knot (a.k.a. Water Knot) and a few different variations of the Fisherman’s Knot. This includes the single Fisherman’s Knot, Double Fisherman’s Knot and Triple Fisherman’s Knot. I consider these knots to be part of a core group of bend-type knots that are important to keep in your knotty toolbox. I also group these in with essential climbing knots, as the Tape Knot and Double/Triple Fisherman’s Knot have applications there. Just like with any knot, tying them is a perishable skill that must be practiced until it becomes second nature. (Strength: 2/Security: 3/Stability: 2/Difficulty: 2) See below for what these ratings mean. The Tape Knot is a quick and simple knot which only slightly differs from the traditional overhand knot. Commonly tied with tubular webbing, which is often referred to as tape, this webbing is used in climbing to make slings, runners and anchors due to its strength, surface area and ability to lie flat. As shown in the video, Tubular Webbing has a hollow core and should be fused to prevent unraveling. Ensure the initial overhand knot used to start this knot is tied flat and loose, so the opposite end of the webbing can be traced back through easily. Also make sure that each end measures 12″ in length after tying, so that a backup knot can be tied in each end, leaving a 6″ tail. 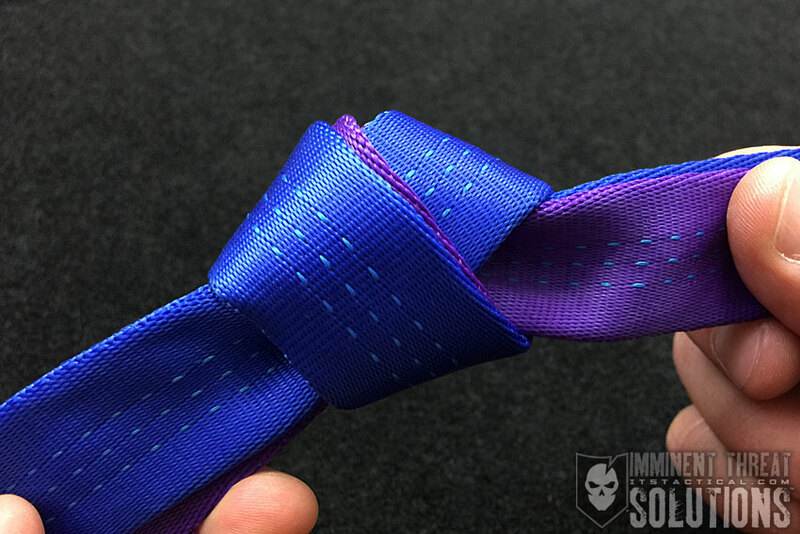 Always tie backup knots as close to the main knot as possible to act as a stopper should the main knot slip. Tape Knots are extremely solid when backed up and can also be difficult to untie once loaded. Because of its streamlined shape, the Tape Knot is less likely to get caught if getting pulled over rocks. (Strength: 5/Security: 5/Stability: 4/Difficulty: 3) See below for what these ratings mean. While the title and rating here is for the Double Fisherman’s Knot, I’ve also demonstrated the single Fisherman’s Knot and Triple Fisherman’s Knot in the video above. All Fisherman’s Knots are great for small line and can hold well with slippery line like monofilament fishing line, hence their name. As the Fisherman’s Knots increase from single to triple, so decreases the chance they have to potentially slip. 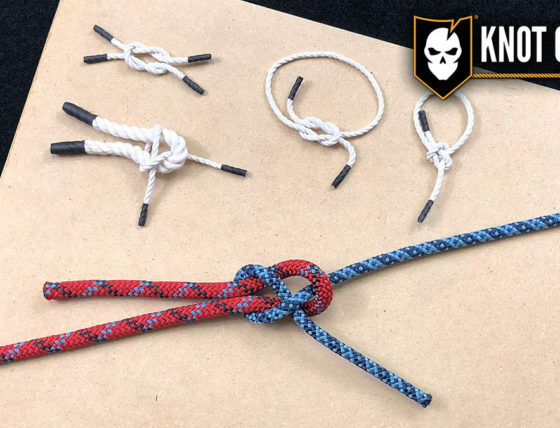 Overall the Fisherman’s Knots are very secure, but with any climbing usage, stay away from the single and stick with the double or triple as the base to create a Prusik Knot. 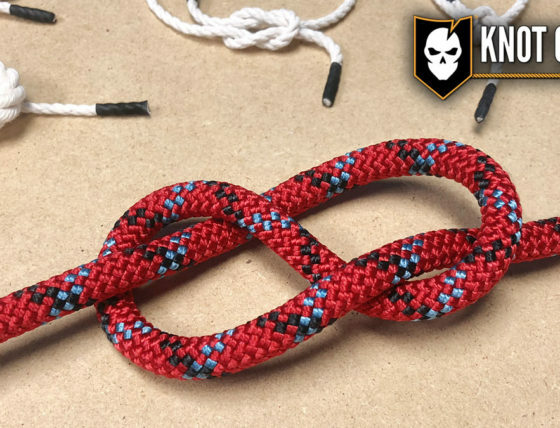 More information on the Prusik Knot is coming to a future KOTW HD. Strength – All knots will weaken the strength of a rope, however, there are knots that are stronger than others. The scale here will reflect how strong the rope remains with the specified knot. Security – The security scale refers to how well the knot will stay tied, and resist coming loose under a normal load. Stability – Stability refers to how easily the knot will come untied under an abnormal load (i.e. the knot being pulled in a direction it was not intended to) A lower score here represents instability. Difficulty – The lower the number, the easier a knot is to tie. Do you enjoy witty banter and nostalgic geekdom all while sipping on a fine aged scotch? Then you’ll love our podcast! Listen to the latest episode now.